ESPN.com's SportsNation is running a feature this summer called "The Face of the Program". They are asking fans to discuss and debate who/what is the face of their beloved programs. It can be a person, place, thing, idea, rivalry, color, anything really. Whatever comes to most people's minds when they think of a certain football program. Instead of commenting on ESPN's page, lets bring part of the discussion here. Hopefully we can avoid the OSU and MSU trolls, unlike our ESPN counterparts. Of course, to start us off, allow me to weigh in on what I think the face of the Michigan program is. 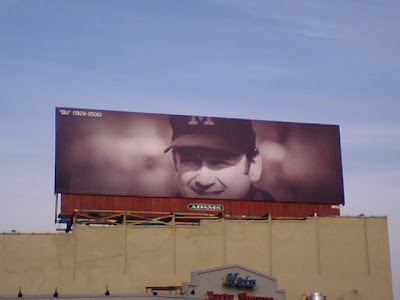 My take is, it has to be no one other than the old coach himself...Bo Schembechler. 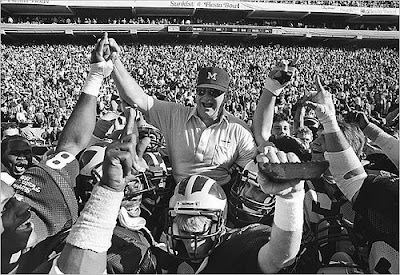 There is simply no doubt, Bo has been the most influential person in Michigan's rich football history. He's the standard for any coach that follows him. Bo's influence is clearly visible in the character of his assistants who became head coaches, and the players he coached. There are many things you can point today, that Bo had a direct hand in. From the facilities, to the band, former players and the uniforms, all of that takes a back seat to the legendary coach. Although I think Bo was a great coach/human/I wanna have his babies. 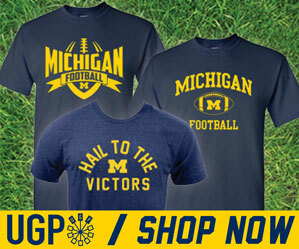 I think Michigan's football program has had many great coaches throughout it's history. With that being said I think the face of the University of Michigans Football program is bigger than any one coach or player. With that being said I would have to go with the Big House along with their helmets/uniforms! I would agree that Bo in modern day is the most important symbol for Michigan Football, but as a program overall, the icon most representative of the maize-n-blue throughout history has been the famed "winged" helmet.